Axminster garden machinery was formed in 1999 Phil Roper who has worked in the horticultural industry as a garden machinery expert for some 32 years. As a sales engineer and manager this background gives us the chance to offer our customers both old and new expert knowledge when either choosing either new or used equipment or even advice or recommendation. When repairing machinery we at Axminster Garden Machinery firmly believe in quality engineering and design when it comes to new equipment and I personally carefully select every piece of machinery we sell and have used and tested all the machinery we offer. We pride ourselves on the fact that all the equipment we sell we are factory main appointed dealers for this gives the customer a piece of mind when it comes to to spares or repairs or servicing. We can provide the full backup. 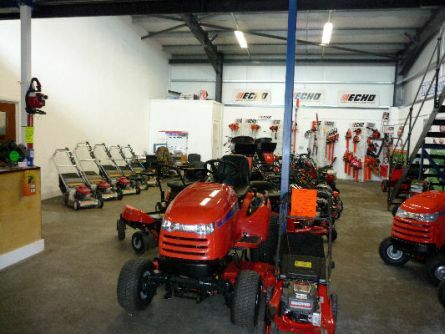 We are a complete garden machinery business we are main dealers for everything we sell which means we offer you the customer the complete package as we have something for everyone with full back up service and parts. We at Axminster Garden Machinery are small enough to care and big enough to cope.